All data is transmitted through Alibaba Cloud's infrastructure, with no risk of being exposed to the Internet. Supports long-distance and end-to-end connection through dedicated networks with low latency and high bandwidth. Uses backup connections and Alibaba Cloud's high-quality infrastructure to guarantee the stability and reliability of communications. Enables you to deploy your services in multiple on-premise data centers and builds a converged network to connect these data centers to VPCs. VPCs can be completely isolated from each other or interconnected through high-speed connections. This improves the flexibility of the network topology. Supports dedicated and high-speed VPC interconnection across Alibaba Cloud accounts. Supports dedicated VPC interconnection across regions to guarantee the quality of communications. Interconnects networks through network function virtualization (NFV) to achieve dedicated communication with low latency. Supports a 10 Gbps or higher bandwidth for VPC interconnection. You can use a large amount of applications to transmit data at the same time. Allows on-premise data centers to communicate with VPCs through dedicated and high-speed connections. This allows you to build a converged network based on different architectures. Provides multiple endpoints in the domestic regions, and leased lines in the international regions, such as Singapore and United States. On-premise data centers can connect to VPCs in all regions through the same endpoint. You can connect on-premise data centers to the cloud through ISPs or Alibaba Cloud partners for faster, easier, and more cost-effective connection service. Express Connect is a ready-to-use service that supports multiple billing methods to meet different user demands. This service also supports various management platforms to implement a all-in-one service. 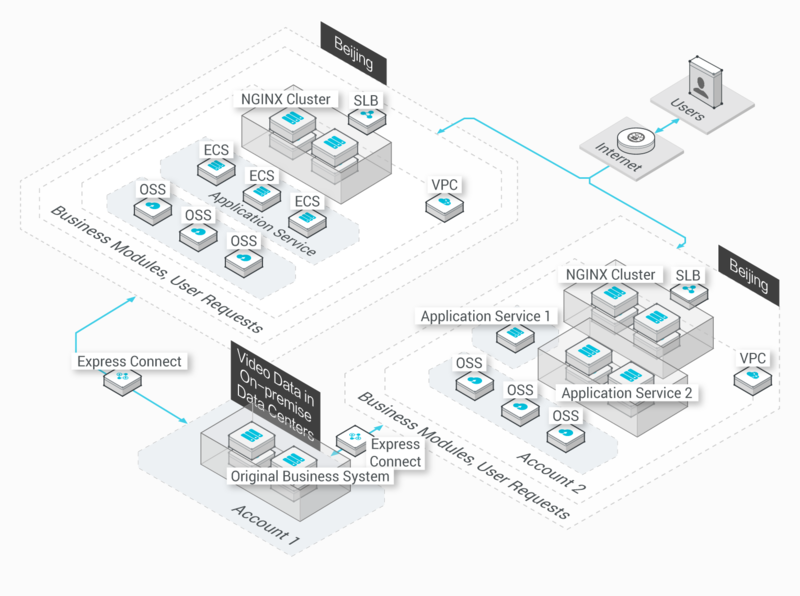 Express Connect is a ready-to-use service that supports dynamic configuration. You can dynamically adjust your network in the cloud. Supports the subscription and Pay-As-You-Go billing methods to meet different user demands. You can call Express Connect over its API or manage this service in the console. In this scenario, a large business platform is deployed in Alibaba Cloud VPCs. Business systems are managed by different Alibaba Cloud accounts. Dedicated and high-speed interconnection is required to provide real-time exchange of business data between these systems. VPCs are software-defined networks, which can be customized on demand. High-speed interconnection is used through dedicated networks to guarantee the quality of communication. VPCs can communicate with each other across Alibaba Cloud accounts. Before Express Connect can be used, business systems are created in on-premise data centers. When Express Connect is used, you can create your business systems in VPCs across regions to reduce the costs. Express Connect enables you to smoothly transfer data from your data centers to VPCs through dedicated connections. Allows you to build isolated business systems in VPCs across regions. Supports interconnection between on-premise data centers and VPCs to achieve smooth business migration. In this scenarios, your business systems are deployed in VPCs. To accelerate your service delivery, you must provide nodes across regions. In addition, these nodes must can communicate with each other through high-speed connections. Deploys your business in VPCs to ensure the security and reliability of your data. Supports VPC interconnection to guarantee the quality of communication across regions. Supports Express Connect-based VPC interconnection with a bandwidth of 10 GB. This allows you to use a large amount of applications. 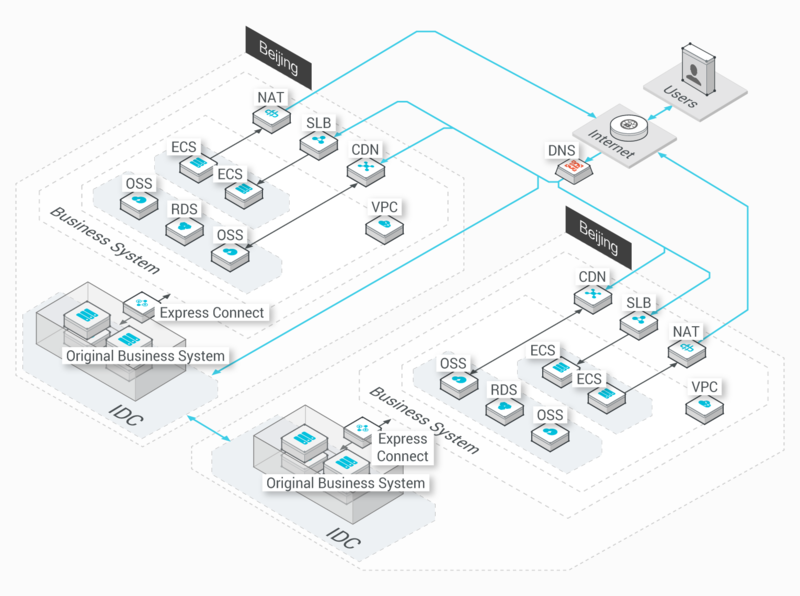 In this scenario, your business systems are deployed in VPCs across regions. All core data is stored in on-premise data centers. The on-premise data centers communicate with each other through optical fibers. The cloud and on-premise data centers use leased lines to achieve high-speed data transmission. Deploys your business systems in multiple regions, which enables users to access the nearest node. Core data is only stored in on-premise data centers, for security.